It is back to basics and is easy as abc, 123 with an old fashioned game that has stood the test of time. You played in grade school but now the rules have changed in an adult playground of riveting prizes and robust bingo games. ABC Bingo bridges the childhood games into a grown up entertainment oasis. This bingo web site boasts merriment and with trail of magnificently colored stars that say yes, your bingo dreams can come true. ABC Bingo provides easy navigation creating a user friendly atmosphere. Registration is a snap and requires no hassle of registering a credit card to get started. Enter a valid email for verification purposes and you will promptly be launched to the site and ready to play. The list of latest winners is proof enough that reaching for the stars is possible with big daily winners and totals that are in 6 digit figures. Owned by Brigend Limited, they offer powerful resources and are part of the independent B2B division of 888 Holdings Plc. Dragonfish is a software developer that has provided products to over sixty success online bingo operators. ABC Bingo is registered and licensed in Gibraltar and follows the strict regulations and guidelines. Bingo Coverall Jackpots offer an astonishing million cash prize. It is hard to imagine winning that type of life changing cash but it is possible when reaching for the stars at ABC Bingo. 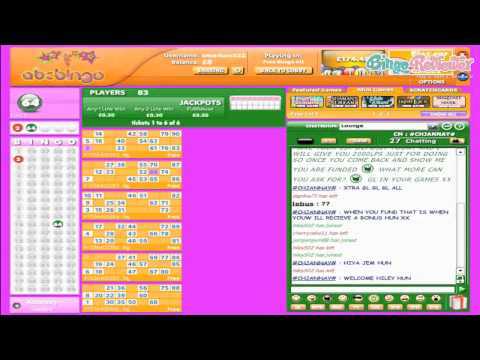 90 ball bingo and 75 ball bingo are available with Progressive Jackpot games. Team Bingo is a great way to gather up your bingo buddies and participate in competitive games. The three top teams win with the top prize at a staggering 1,000,000 Loyalty Points. Featured Games encompass an array of quality Slots including fascinating games that have took online gaming by storm. Favorites include Bejeweled with cascading reels, X Factor themed after the famous TV show and unique slots like Cubis that are a brand new way to play. The £6,000 Free-4-All is open to all funded players and fun players. There is over £200 given away every day and over £6,000 every month. Enter the bingo games Free and walk away with some enticing cash wins. The Weekly Gazette will keep players updated on the weekly news of current promotional offerings and special events. Fantastic promotions may include Jackpot prizes, holidays and Deposit Bonuses. Bingo Friends Forever (BFF) rewards players for their loyalty with extra Bingo Points and benefits that increase with each rank. The first three levels are determined by the total amount spent on games. BFF Gold and BFF Platinum are ultra-exclusive and are by invitation only. Special Promotions, Monthly Cash-Back and entry to the BFF Room is reserved for the highest VIP status are just some of the benefits players can look forward to. The Million Bingo Jackpot is the most appealing of all the games and a rare opportunity for players to win that kind of cash on a Coverall. The Slots are graphically amazing with special features that are gripping. We rate ABC Bingo to the max with 5 Pink Hearts.